Are you going green? …Go Botanical! 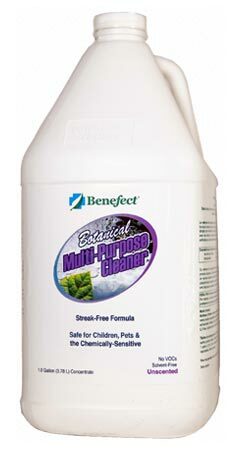 For a complete green cleaning system use Benefect’s line of Botanical Disinfection & Cleaning Products. Benefect Multi-Purpose Cleaner is a revolutionary cleaner concentrate that achieves the professional results you need without hazardous synthetic chemicals. For use on all general cleaning tasks. Made from botanical, biodegradable ingredients, it is safe for children, pets and the chemically-sensitive. It contains no chemical masking agents, fragrances, petrochemicals or phosphates. It has been proven as effective as leading national brands in standardized lab tests and the dilution rate makes it an economically viable alternative. No Fragrances, Dyes, Petrochemicals, Phosphates, EDTA, NTA or other hazardous or unecessary ingredients. Made from 100% renewable resources, it biodegrades aerobically & anaerobically. It has no EDTA, NTA, petrochemicals, preservatives, optical brighteners or phosphates. Some cleaners have up to 10% V.O.C.s that evaporates while drying and pollutes the indoor air. Multi-Purpose Cleaner contains no V.O.C.s and does not pose any health risks to building occupants. Ideal for cleaning floors, walls, countertops, windows, mirrors, metal surfaces, household contents and glass. Also great for moderat soils on textiles and other delicate surfaces.